Since we were last online, we have spent a wonderful few days in the Galapagos Islands and the Ecuadorian cloudforest. We took our trip to the Galapagos from Quito, Ecuador and had a couple of days to explore this old city and to climb the health and safety risk that is the Basilica del Voto Nacional! We were rewarded with great views of the city but to get to this point we had to risk our lives crossing a rickety plank inside the main roof and various steep stairs and ladders! 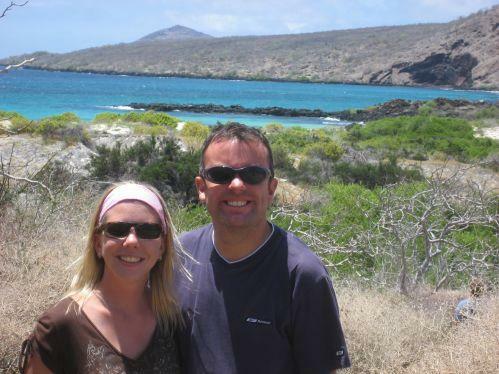 We loved our time in the Galapagos, a magical place and very different to anywhere we´ve been before. We hiked and snorkelled every day and saw a fascinating array of wildlife. It was amazing how close we could get to them. Take a look at our photo album for some of our favourite pix! On our return to the mainland, we visited the cloudforest 2 hours north of Quito. En route, we saw both the real and the originally miscalculated equator lines! We visited a quirky and interesting museum where we learnt how gravity on the equator affects such things as your weight, strength, the draining of water and your ability to balance an egg on a nail head!! We loved our relaxing visit to the cloudforest. We stayed at a sustainable eco-lodge in the middle of nowhere! We had to take a cable car across the Rio Mindo to get to it. We walked through the forest, chilled out, went tubing (luckily not as scary as in the wet season in Laos!) and zip-lined through the canopy (this was very scary!). We arrived in Santiago, Chile on an overnight flight this morning - time now for a little sleep!